Choose any 4 of these 8 cardio-blasting, fat-burning moves for a superfast workout. Strapless dresses, cocktail parties, and that New Yearâs Eve kiss: seems like thereâs a lot to look good for this holiday season. Along with the pressure of looking your best for the company parties and family gatherings in the next few weeks comes the added temptation of the sweetÂ holiday treats that seem to be within armâs reach at all times. Not to fear. This workout plan with cardio-blasting, fat-burning moves will allow you to indulge in moderation without feeling the guilt. Itâs designed as a full body, circuit-training workout, so you can work more muscles at one time, which translates into more calories burned. How it works: choose any 4 of the 8 full-body exercises below and keep rotating through them for 20 minutes, 4 times a week. Mix and match the moves and youâll have enough variety to last you well into the New Year! Note: Since I'm now 7 months pregnant, Los Angeles based personal trainer Kourtney McCullough demonstrated the exercises. Forget aimlessly jogging on the treadmill, going nowhere (literally and figuratively). One of the quickest ways to get your heart pumping is by jumping rope. Thirty seconds to a minute is more than enough to fire up the heart, while simultaneously working the entire body. If you donât have a jump rope handy, you can still simulate the movement for the same effect. For maximum results, start all of these workouts with a 1-minute jump rope. Come to a plank position. 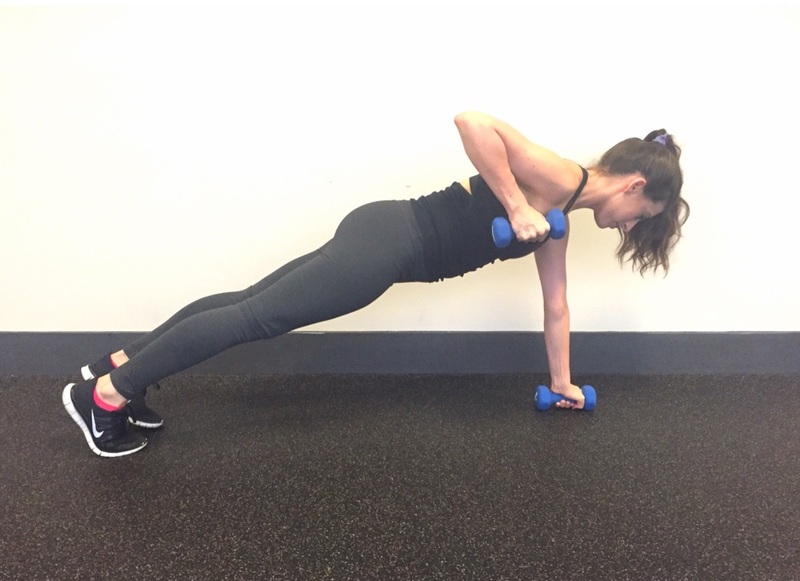 Draw the left knee into the left elbow; then come back to a plank. Take the same left knee and draw it into the right elbow and then come back to a plank. Thatâs one rep. Do 15 reps, picking up the pace towards the end, and then switch to the right leg. Hold a 5- to 8-pound dumbbell in each hand and get into the top of a pushup position. Bend your elbows coming down into a push up. 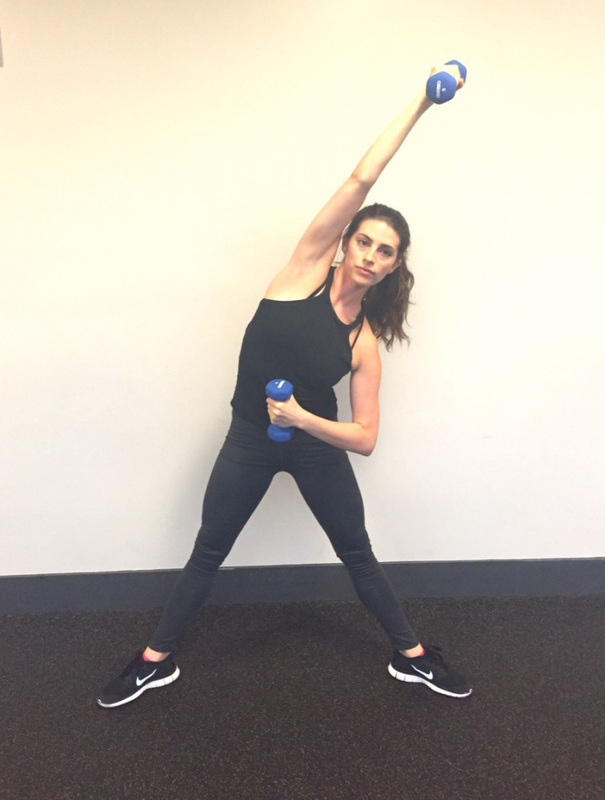 After you straighten your arms, pull the right hand up so that the dumbbell touches your right shoulder. Continue alternating sides until you have done 10 on each side. If that's too hard, skip the pushups, or do them on your knees. Jump Squats are a perfect example of a plyometric exercise, where muscles are rapidly extended and briefly rested. They are among the best moves to build lean muscle, which in turn helps you torch unwanted fat. (They also give you an extra cardio boost). Starting in a squat with your feet hip-width apart and your knees directly over your heels, jump as high as you can off the ground before returning to your squat position. Aim for 20 reps. For an extra challenge, hold a set of dumbbells. Start in a wide sumo squat with your thighs and knees turned outward, arms bent by your sides. As you exhale, reach your right arm up diagonally toward the left. Return to your sumo squat and switch sides. Repeat 15 times on each side. By reaching in the opposite direction, you're working your obliques in addition to your glutes, legs, and arms. Think of a regular bicycle crunch, except with straight legs. Lie on your back and put your hands behind your head. Bring your right leg straight up and touch your left elbow to your right knee. Continue switching 15 times each direction, picking up the pace as you go. Maintaining a straight leg instead of bent one allows you to stretch the back of the legs as you work the core. Stand behind a step or box that is about knee height or just below. Place one foot on the box and step up, allowing the other foot to meet it and then lower the other foot back down to the floor with control. Do 15 on the right leg before switching to the left. Option: Hold two dumbbells in each hand and press your arms up overhead each time you step up for more of a challenge. While lying on your back, place one foot flat on an elevated surface (a box, a BOSU ball, etc.) and raise the other leg up toward the ceiling. Keeping both hips on the same level, squeeze your glutes and press both hips up into a bridge position (shown). Then, lower your hips back down, being sure to roll down one vertebrae at a time in order to protect your lower back. Feel free to use your triceps to help lift your hips up. 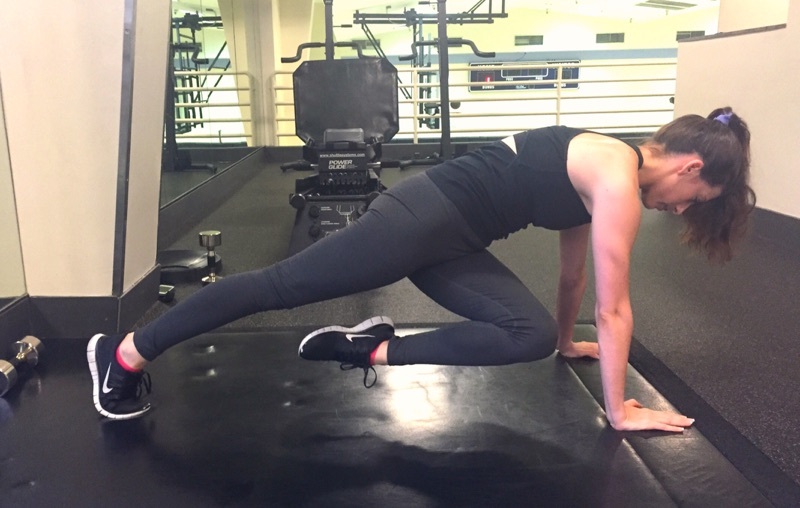 This exercise is designed to work the entire back half of the body. Do 15 on each leg. Rest 30 seconds and then repeat the sequence. Continue for 20 minutes. For more on weight training for weight loss, check out How To Shed Fat With Strength TrainingÂ and 5 Exercise Swaps That Burn More Calories.